What was I talking about again? Oh yeah, grey! So much grey. As a fashion blogger, I think I'm supposed to be trumpeting how great a "pop of color" feels on a dark, dreary day, but uhm... No. I love wearing layers of black and grey when the skies do the same. This outfit basically breaks down like a checklist of my favorite things this winter. I purchased this boxy-body narrow-sleeved sweater from Madewell in December - for the specific purpose of being cozy on my long flight back to Seattle over the holidays. Then this weird thing happened where I have barely taken if off since. Also in the mix are these little booties from Steve Madden. The stacked heel is sensible without being awkward, and let's be real: black suede goes with everything. Again, hardly take them off. The jeans are my ultimate favorite James Jeans (Icon) moto jeans from last year that have become part of my uniform, which is sort of unexpected with such a trendy style, am I right? But the fit of pretty much every pair of James Jeans is so good I can't help it. Lastly, the hat. I picked up this cozy little treasure at that faux-hipster haven we call Urban Outfitters. And can I tell you something? Their mens accessories are amazing. I picked up this beanie for $15 on my way home from work when it was snowing the other night, and again (again) I hardly take it off now. Dressed in all these dark colors and a knit beanie I feel much more like one of those cool downtown girls I see in Soho everyday than my usual "prep-clectic" self. I kinda dig it. What do you think? 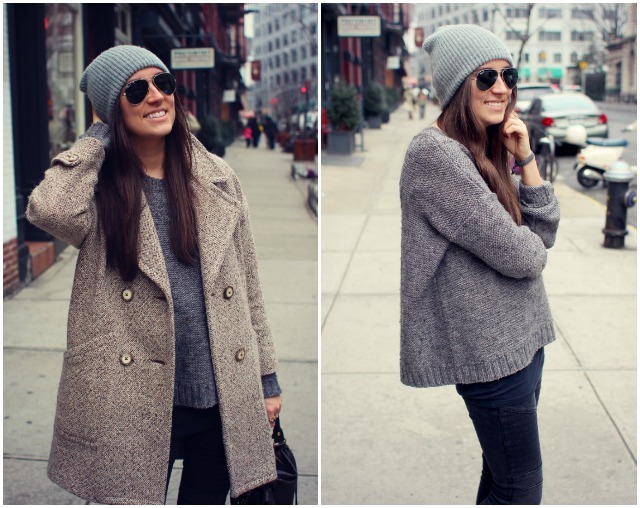 love that sweater + esp with the monochromatic beanie. I'm with you sister, screw pops of color. Sometimes grey just feels so right. What nail polish do you have on? It completes this great look! Love this coat. Such a pretty shape! Ha ha ha, I hear you on the "pop of colour" but grey is definitely my favourite neutral to wear. It's such a chic colour and I always feel good wearing it. Love all of your different shades going on here! Really cute! Simple and clean, but still super stylish! 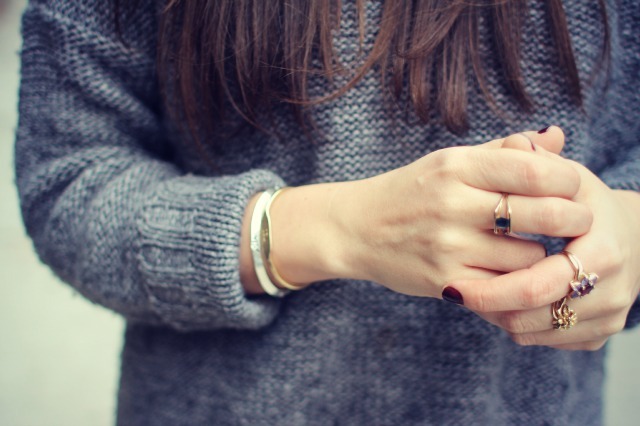 loooooove your blog and your style, you're gorgeous! Love this outfit on you! Neutrals are the best. Does this sweater run true to size? Contemplating sizes! This outfit looks super cosy. Really like casual neutral vibe! Great winter outfit but you could have gone with a ash colour jeans. I love the sweater! How does the sweater run size wise? I'm trying to decide between a small and a medium. Grey sweater give better look for you. Love your blog and your dressing style, you look stunning!